I have been on a kofta kick recently and it’s been a lot of fun playing with different flavor combos in the ground lamb. 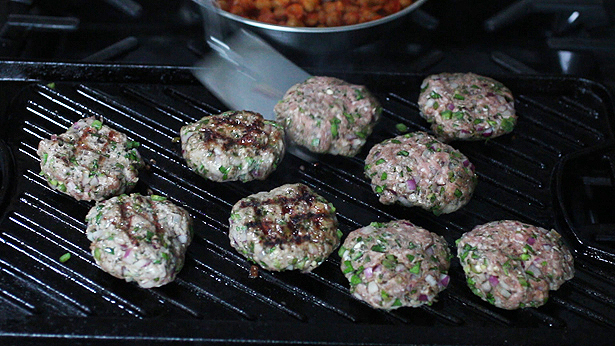 I love mixing up the kofta and shaping them like thick mini burgers and cooking them on the grill. 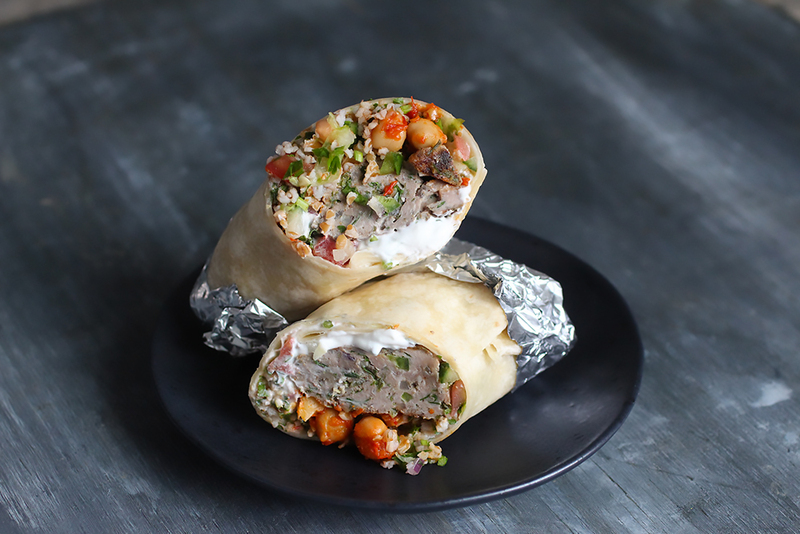 I realized that shawarma, which is one my my favorite ways to eat kofta, is pretty close to a burrito so I decided to take it the rest of the way. 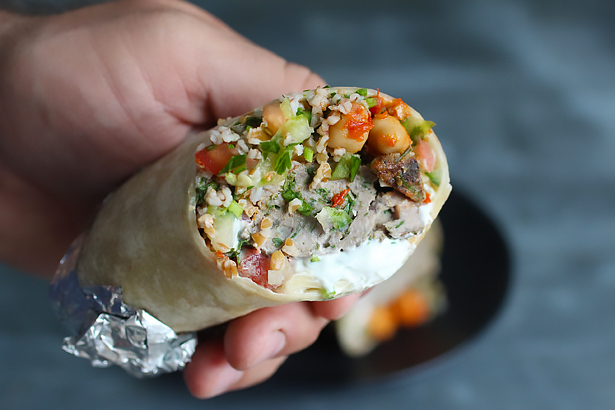 This burrito has spicy harissa chickpeas replacing what would be pinto or black beans, a simple tabouli replacing the rice, a cucumber salsa, and tzatziki instead of sour cream. I loved how these came out and I have been making burritos with the leftovers all week! Continuing with the grilling theme, American Lamb is giving away awesome summer grilling packs, so make sure to check them out and enter to win! 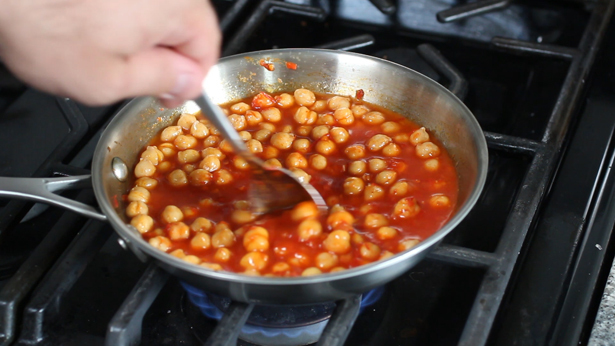 Cook the chickpeas with harissa paste and some water until the sauce becomes thick. Smash about 1/4 of the chickpeas while cooking. A lot of the ingredients crossover from one component to another, so it's good to chop everything at the same time then build each dish. First mix cooked bulgur with lots of parsley and a little tomato and cucumber. Next is the tzatziki - Yogurt, parsley, mint, cucumber, garlic, and lemon juice. 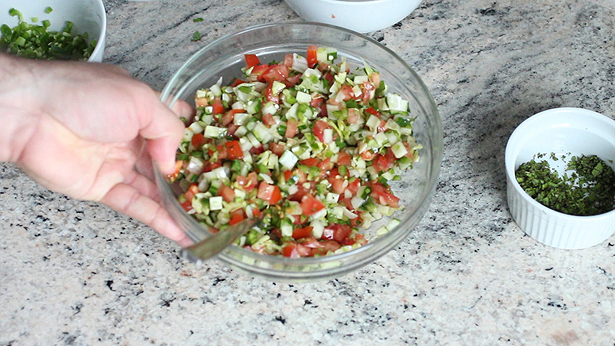 Then the salsa - Cucumber, tomato, jalapeno, lettuce, onion, garlic, and lemon juice. Put everything in the fridge and do the meat mixture last. 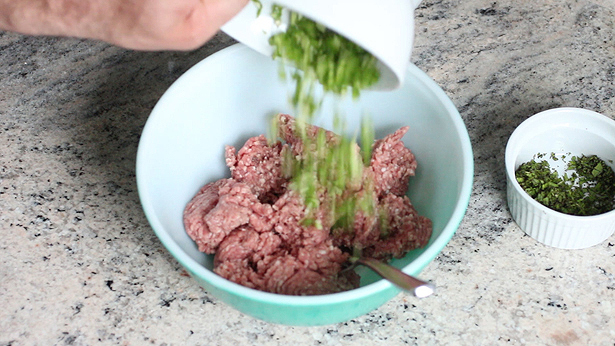 Ground lamb, jalapeno, onion, mint, parsley, garlic, cumin, cinnamon, clove, salt and pepper. Form the patties. Grill them for about 8 minutes each side until browned and mostly cooked through. Tabouli first, then the chickpeas, then the kofta, salsa, and finally the tzatziki. So good! 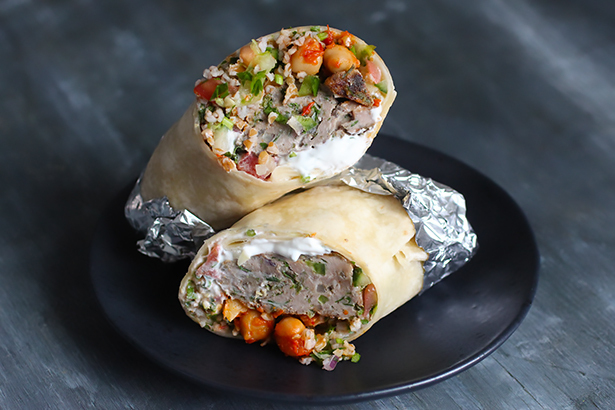 So many great things going on in here and the flavorful american lamb really makes this burrito stand out. 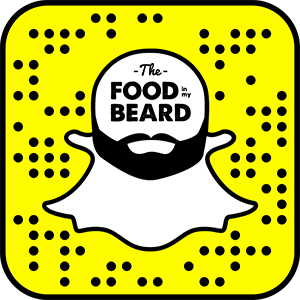 Don't forget to enter the contest here! Add the chickpeas to a pan with the harissa paste. Add about 1/4 cup of water and stir to combine. Bring to a simmer and cook for 15 minutes to slightly soften the chickpeas. Smash about 1/4 of the chickpeas with a fork. Keep warm until ready to build the burritos. 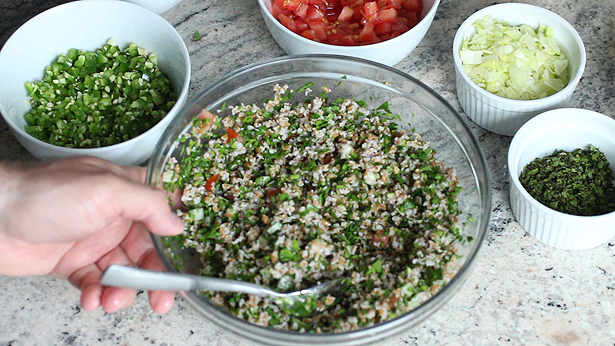 Mix all the tabouli ingredients and set aside in the fridge. 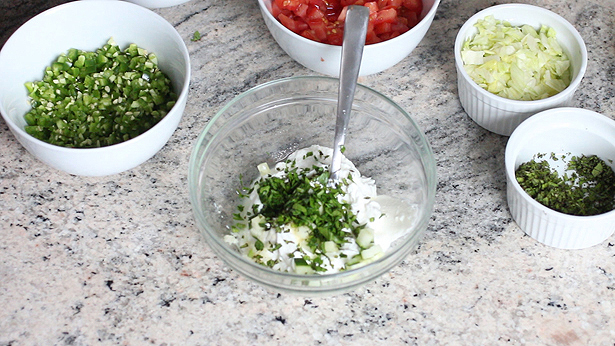 Mix all the tzatziki ingredients and set aside in the fridge. Mix all the salsa ingredients and set aside in the fridge. 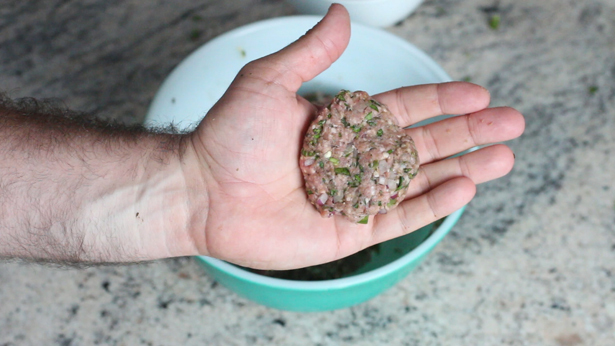 Mix all the kofta ingredients and form small but thick burger-like patties. Preheat grill to high. Grill kofta for about 8 minutes per side to brown and cook to medium well. Microwave the tortilla for about 15 seconds and place onto a square of foil. 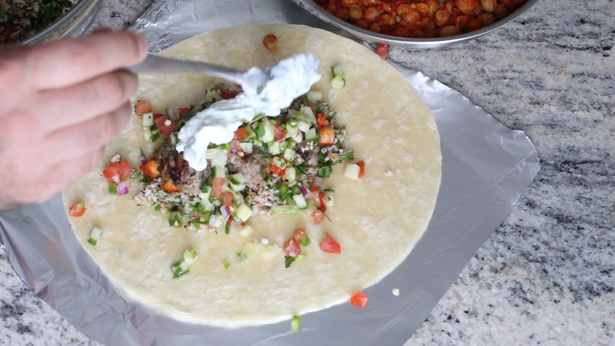 Add the tabouli, then the chickpeas, then the kofta, then the salsa, then the tzatziki. Roll up the tortilla and seal with the foil. Harissa adds such a great flavor to a dish. Can’t wai tot try this at home!